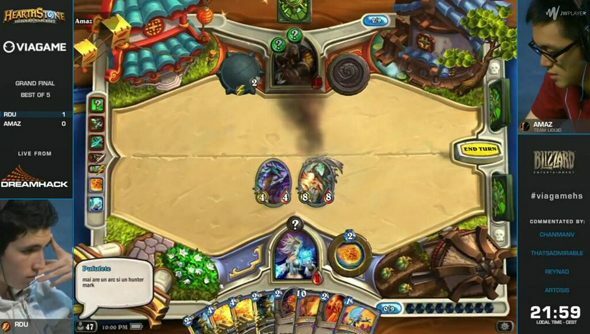 Radu ‘Rdu’ Dima last night became DreamHack’s Summer Hearthstone Champion. The Romanian had cracked portrait after portrait of top players – Darkwonyx, Ek0p, Reynad and finally Amaz – to win the biggest cheque in professional Hearthstone yet. But his win was overshadowed by controversy, after Twitch viewers noticed a Battle.net message during his last few games that gave away the contents of Amaz’s hand. As community opinion divided over whether or not the hint was solicited, both tournament organisers and Rdu’s opponent emerged in support of the 17-year-old. During Rdu’s second game against Amaz, he began to receive a lot of direct messages from his Hearthstone friends list. Visible on-stream as speech bubbles, the majority of the messages were unambiguous declarations of support. But one ‘friend’ sent a message revealing that the single remaining card in Amaz’s hand was Hunter’s Mark. Rdu was visibly upset by the apparently unsolicited help, streamers report, and called over an admin as soon as the game was finished. Tournament organisers called for a 20 minute break, during which Rdu and Amaz’s friends lists were deleted. Play then resumed, and Rdu went on to win the finals 3-0. DreamHack admins and experts reviewed the offending footage, and decided that the game need not be replayed. The extra information came too late to change the outcome of a match Rdu was already on the verge of winning, they reasoned. As Hearthstone Redditors trawled Rdu’s footage for signs of foul play, Amaz expressed support for his $10,000-richer opponent in a video recorded in his hotel room after the finals. “Rdu is definitely not cheating,” he said. “Sometimes you get into the finals and your friends get crazy and they just make bad mistakes and whatnot. That’s kinda what happens. Amaz accepted his defeat, admitting he made “a lot of mistakes” in the finals – and encouraged fans to upvote his Reddit thread in support of Rdu. Amaz was unimpressed by miscommunication during the finals, however – tournament organisers didn’t let him know why they were deleting Rdu’s friends list during the 20 minute break. He further implored Blizzard to recognise the “electric” eSports atmosphere around Hearthstone – and to develop observer modes and tournament settings to make incidents like these impossible. Is the fault here Blizzard’s, do you think? As long as fans and ‘friends’ can sabotage a major league game with a single message, professional Hearthstone is going to suffer.